A 3-year-old Great Dane named Zeus who stands 44 inches — more than 3.5 feet — tall has been named the tallest dog in the world by Guinness World Records. The organization just released their 2013 edition. Named after the Greek god of the sky, Zeus has dethroned the previous record holder, Giant George, another Great Dane. Zeus bested George by one inch to take the title. Weighing 155 pounds, Zeus is a pet therapy dog who consumes a 30-pound bag of food every two weeks. 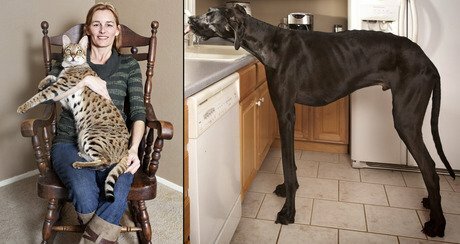 He lives with his family in Otsego, Mich.
Guinness also announced the world’s tallest cat in their 2013 edition: Savannah Islands Trouble took the prize, measuring 19 inches in height. Named Trouble for short, the cat was a hybrid of large-eared wild African cat and domestic cat. Sadly, the 4-year-old feline passed away on August 15. He lived with his family in Sacramento, Calif.
More information about the new 2013 World Record edition can be found at the Guinness website.